CATANIA, ITALY: The University of Catania bestowed the Medal of the University on Dr. Panos Pardalos, Distinguished Professor of Industrial and Systems Engineering, on Friday, January 11. The award was in recognition of Dr. Pardalos’ broad contributions in science and engineering. Pardalos was a co-organizer of the Learning and Intelligent OptimizatioN Conference (LION 7) in Catania between January 7-11, 2013. He also delivered an invited talk at the University where he received the medal. 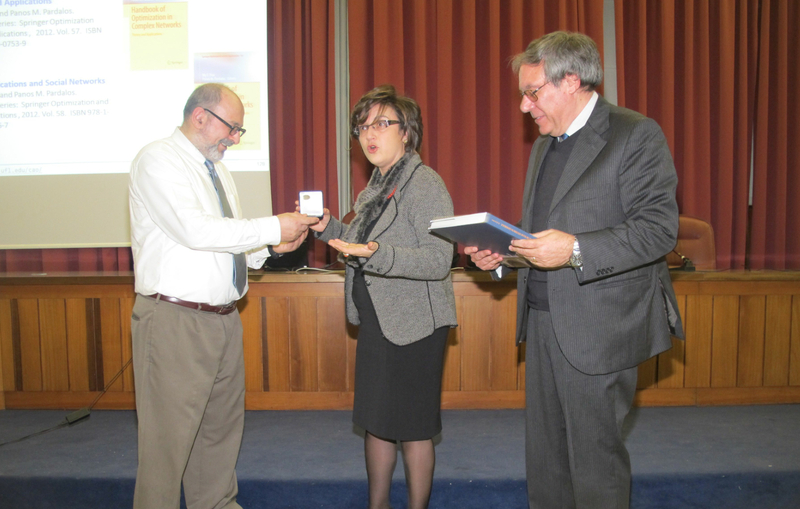 In the picture, Pardalos is receiving the award from Professor Cavallaro, Head of the Department of Economics, and Professor Mulone, Head of the Department of Mathematics & Computer Science. The University of Catania, founded in 1434, is one of the oldest universities in the world. It is the main university in Sicily.